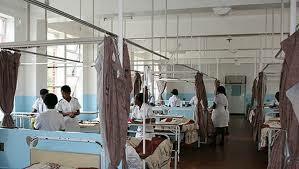 THE Matabeleland North Provincial Medical Director, Dr Alfred Muchara, has threatened disciplinary action against staff at Victoria Falls District Hospital following allegations of baby swapping at the institution. The hospital launched an investigation after a couple, Mr Faison Nyathi and wife Ms Juliet Dube, alleged that a nurse aide (name supplied) had swapped its baby boy with an infant’s corpse to cover up for negligence. Ms Dube (22) of Mkhosana suburb gave birth to a baby boy on 27 August and said she was shocked when the nurse aide told her two days later that the infant had died. She alleges that nurses swapped her baby with another woman’s child who died after falling from a bed to the floor when she gave birth without assistance while nurses ignored her. Dr Muchara said only DNA tests will solve the puzzle, while heads will roll if the allegations are confirmed. “At the moment we are dealing with the issue with the police. We are still making investigations on both sides as we try to verify the complaint,” he said. Dr Muchara said evidence is needed to be able to deal with the issue and investigations are likely to take one week. “There is the issue of objectivity to verify claims and this will be done through DNA tests. The family offered to voluntarily do the DNA tests and we have no problems with that because there is no other way to verify. If it’s true, someone will have to be accountable and disciplinary action will be taken,” he said. They have pledged to fundraise to help the family and were expected to meet yesterday evening, according to Victoria Falls Combined Residents Association, Mr Morgen Dube. At the National University of Science and Technology in Bulawayo, the test costs $100 per person.